The Narcissistic Mother is an historic psychoanalytic diagnosis that removes virtue from some of the unassailably presumed tenets of motherhood. 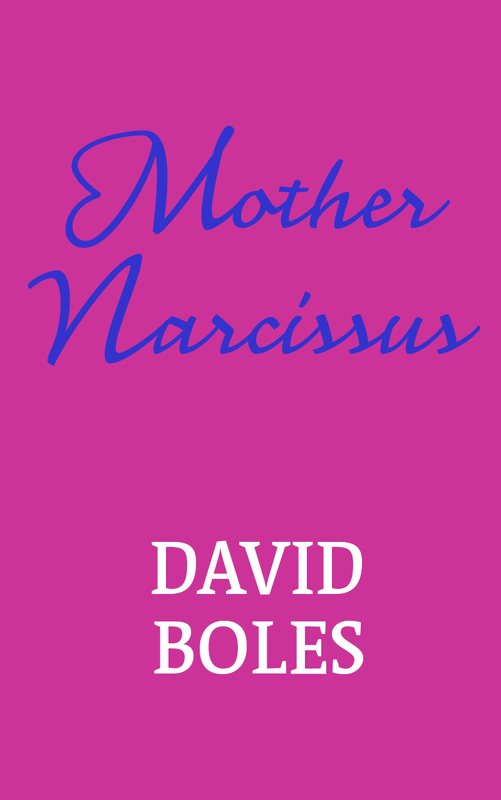 This fanciful autobiography -- Mother Narcissus -- is shared from the role of the obtuse outside observer, the para-omniscient elder self, and the Godforlorn point-of-view. What is real and what is painfully imagined is for you to decide. The storytelling is purposefully shared in bright, taut, shards of childhood memory and in the bitter limpets of an insecure adulthood. The title of this book leads the example of the writing. This is not about the son, but rather about the mother’s effect upon the son. If you unconditionally love your mother, and she you -- this may not a relatable book, unless you appreciate the Art of a slow self-immolation -- if, however, you’ve survived a tortured darkness where your mother set herself up to be your perfect, worst, enemy and best competitor, then this was written precisely for you. Paddy was born in the middle of winter during a crusting ice storm. It was a post-midnight January morning when his mother called her estranged husband to take her to the hospital in the middle of a blizzard. Waiting for her un-betrothed to pick her up at the home they’d build together, she carefully drew her lips into a purposeful pursing for the application of a thick, waxy, bloody lipstick -- triangulated by blistering black eyes and charcoal hair, all coordinated to enhance the darkness of her cold and unbeating heart. She checked the reflection of her applications in the mirror and her bluing lips turned frosty as Marko’s headlights lit up the driveway. Paddy’s biological father arrived only by order of the court. Marko was to deliver his wife to the hospital for the birthing of his first-born son who was pre-born into a broken family. Antonia emigrated from Latvia long before it made a modern war transformation into a political pawn; and her cheating husband, Marko, was a Soviet immigrant with fresh Shingles scars pocking his wrinkled face. The nerve virus was alive and eating his skin from the inside out. Shingles suffering was not enough for Marko -- he had to visit his moral sins upon his estranged wife and unborn son as well. After a five-year marriage of inconvenience to Antonia, Marko decided he’d had enough of her reflective ways and decided to reflexively act in his own best interest, but never his son’s, and find another woman for breeding even though he’d already tossed away one unborn life in his wake. Marko and Antonia had settled on a life together in the bland Midwest. They created a home dead in the center of the country bound by the remnants of a festering dust bowl where heat and humidity during the eternal Summer months backed up along the mountains and settled over an entire State -- to cook both livestock and people from within their August skins. That wasn’t living, it was suffering through inevitable death.